Here are some key resources for the Inquiry Hub’s 2017 Cmolik Prize for the Enhancement of Public Education in BC Application. Update: We were named one of 3 Finalists for this Prize. See details about the winner, the co-finalist, and those that made the honour roll here. Foundations of Inquiry 11 and Applications of Digital Learning. After students work on these courses for the first 2 years, they then move on to IDS – Independent Directed Studies that they design with a teacher. An Ignite presentation by Inquiry Hub Teacher/Facilitator John Sarte. Creating Inquiry Time to Dream-Create-Learn – JPG. An app developed by our students, which took on a life of its own. An Independent Directed Study (IDS) “Cali & Ko.” ~ A web comic with a focus on representing diversity. 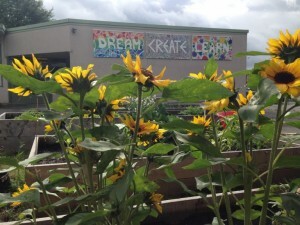 The story behind Our Community Garden ~ One of Inquiry Hub’s first inquiry projects. Our L.A.R.P. ~ Live Action Role Play. 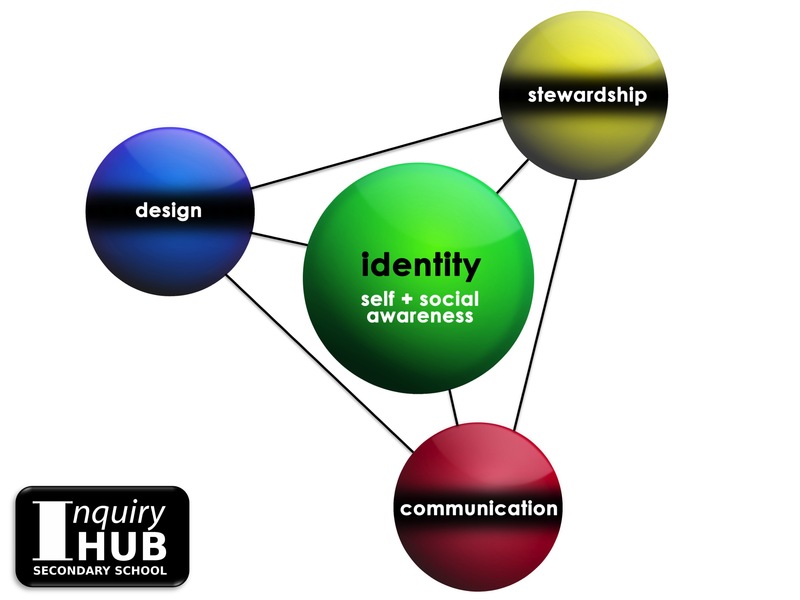 How Inquiry Hub’s Logo came to be. The following image and description were created for an application for the Cmolik Prize. ‘Assignments’ like this are great because they force us (teachers John Sarte, Alan Soiseth and VP David Truss) to think about what it is we value, and strive towards as we build our program at Inquiry Hub Secondary School. Doing this has additional value to Coquitlam Open Learning (the district’s online school that was the founding program that Inquiry Hub developed out of), because embedded in the descriptions of possible programs below, online course credits and blended learning course credits could compliment and enhance many of the ideas and program suggestions made. Here is a student created video of teacher John Sarte sharing a bit about Inquiry Hub Secondary School, inquiry learning, and some of the projects he has worked with students on. 1. Create time, space and supports for students to be self-directed learners. b) Providing resources and supports online so that students don’t need a teacher in front of them for all the activities and assignments required in the course. 3. Students get credit for following their inquiry/passion projects: Develop or *borrow ‘local’ courses that are competency based, looking at ‘soft’ skills, which students can improve on regardless of the content of their inquiries. * Here are two of our competency-based courses: Foundations of Inquiry 11 and Applications of Digital Learning. How can you use this information? Here are a couple questions for you, depending on what level you teach/lead. The image and descriptions considered below, describe a typical 4-block semester schedule in a high school. It would not be hard to apply the same to a high school that runs full-year courses. What is one unit in one course that you can transition from a more traditional model to an inquiry based learning model? Which of the formats below can you find colleagues/administrators to work with you to implement? It would be fairly easy for middle school teams to implement many of these ideas into their program right away, and for Junior high schools to start thinking about offering combined courses to integrate learning through big themes and projects. Which courses/subjects can be combined to create dynamic ‘big idea’ themes that students will find interesting to explore with inquiry-based learning? Are your students’ timetables designed to maximize flexible learning opportunities or can they be changed to provide more flexibility? When you have your own students for most of the day, the potential to provide time and space for inquiry and cross-curricular activities is amazing, whereas it can often be challenging to find the time to work collaboratively with other teachers doing similar things… But collaboration time between teachers is a catalyst for great projects and for sharing innovative practices! Who can you collaborate/connect with to help you? Creating Inquiry Time to Dream-Create-Learn JPG. Below you will find the image broken into smaller sections, with greater detail provided after each image, then the full image is shared after a few final thoughts. ~ Creating the time and space for self-directed, personalized, inquiry learning..
At Inquiry Hub Secondary School we have embedded time for students to Dream, Create, and Learn (DCL) for greater than 30%, and up to as much as 50%, of their school day. During DCL, students have time to work on: assignments given to them by teachers, online-blended components of their courses, or inquiry projects that they design or co-develop with teachers. Students get course credit for their self-directed inquiries and passion projects. By implementing so much time in a students’ schedule to DCL, teachers must redesign their program to create time and space for students to work independently. When teachers plan their teaching time with students it necessarily needs to shift to include assignments that connect to, facilitate and support learning happening during DCL time. By also explicitly teaching inquiry learning as a course (Foundations of Inquiry), we create space for students to work on projects of their choice, assessing competencies of core skills rather than on content they are learning, which can vary based in their passions and interests. Here is a look at a continuum, starting with individual teachers implementing more DCL time in a specific class, and moving to a model of entire system change, designed to provide students more time to Dream, Create, and Learn as a significant part of what they do at school, rather than something that is added on to their schedule. The final section “Flexible School Schedule Designed Around Time to Dream, Create, Learn” describes a model that disrupts the typical one-block-per-class schedule seen in most high schools today. 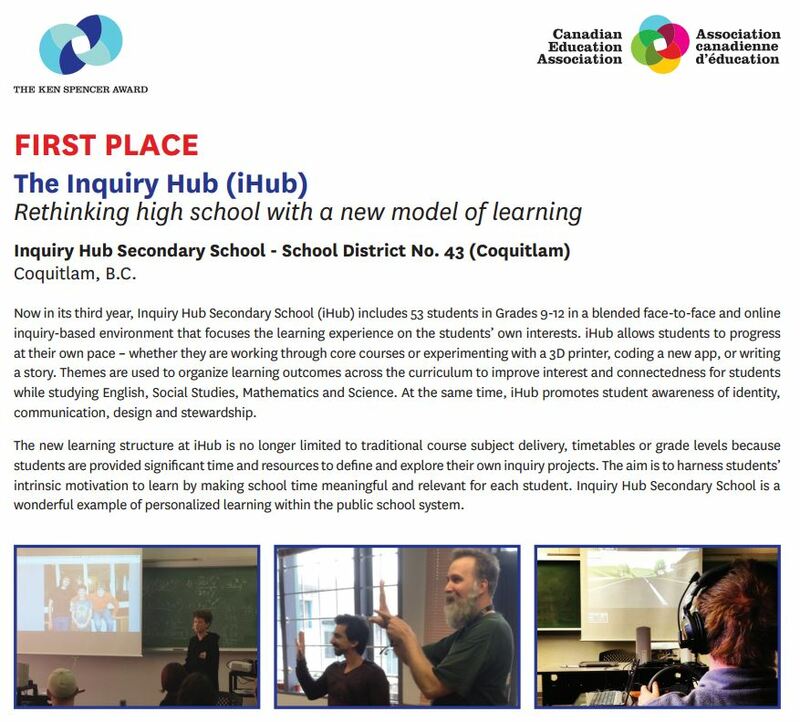 While Inquiry Hub Secondary is a stand-alone small program today, it has the potential to be a fully developed system in a much larger school with a redesigned schedule where every student is given time to Dream, Create, and Learn. ~ No change to traditional timetable, single teacher, single class adaptation. On an individual basis, teachers can implement varying degrees of self-directed, personalized learning within a single class. The limitations of this include challenges around integrating subject matter, when there is only one course being taught, and limited flexibility in creating the time for students to explore what they want to explore. While Genius Hour is an excellent example of how a teacher can implement self-directed, passion projects, there is no need for any real change to the traditional school timetable, and a change in teaching approach beyond the dedicated time allotted is completely teacher based. Advantages: No system change required. Easy for a single teacher to implement. Disadvantages: Not systematic, teacher dependent, limited flexibility. ~ Little or no change to traditional timetable, potential for teacher collaboration. There are two key variations to this model, with a significant difference. The first variation is simply to provide a single teacher with a double block of time to teach two integrated subjects. The second variation is to have two teachers teaching at least two courses, integrated with subject matter being provided through integrated assignments and embedded DCL time. A double block of time is given to students, ideally providing prep time in alternate blocks for the teachers during the shared class. In this second variation a teacher benefits from collaboration and teamwork with another teacher. If the teacher schedule is backed with prep time for the teacher not scheduled to teach during a specific block, there can be significant scheduling advantages with one teacher being able to take students longer for one day, and the other teacher doing same on another day. Furthermore, when students have their DCL time, teachers can co-support students and/or use the time to collaborate. When courses are combined, and inquiry projects as well as online supports are developed, there is potential to provide more than 2 courses in the same time normally provided for just the 2 courses: Additional courses like Work Experience, Leadership, Digital Literacy, and Independent Directed Studies, or the new Career Life Connections 12 can be provided. This can further increase the prep and collaboration time of teachers since one of these 2 teachers can have an additional unscheduled block of time in their schedule to support these additional course, or a third teacher can be included into the teaching mix (responsible for integrating this third course into the student schedule, supported with online materials in a blended learning environment). This could be an excellent ‘entry level’ approach to creating DCL time because it encourages flexible cross-curricular learning, provides built in teacher collaboration time, and combining two or more courses encourages thematic projects that can allow for student directed interests. Advantages: Minimal or no system change. Easy for a small group of teachers to implement. Disadvantages: More challenging to schedule in a block timetable. Enrollment in a double course can be a ‘hard sell’ for students, since it isn’t a full program. ~ Timetable adapted to provide clearly defined time for students to be self-directed. In this model, students are provided flex time in their schedule, ideally to provide them self-direct learning (DCL) time to follow their passions and interests. The schedule can have flex block time every day, or there could be just one or two flex blocks provided each week. In addition to DCL time, flex block can also be used for students to catch up on school work, meet with teachers, get support for their current courses, work in teams on projects, or to extended class projects. Flex time can also be provided to integrate learning connected to specific courses for additional credit, such as Independent Directed Studies. Students do not necessarily need to connect with the specific teacher in their previous block before the flex block, but credit for work on self-directed projects would have an assigned teacher-mentor. Advantages: This model can help a teaching staff find value in creating more self-directed time for students. It can provide teaching staff with opportunities to share their own passions and interests with students. Disadvantages: Flex block compartmentalizes DCL time, limiting the overall flexibility to provide self-directed time beyond the time allotted daily or weekly. ~ Teaching teams provide students with a 1/2 time, flexible, cross-curricular program. Students dedicate a semester, or half a semester for a full year, to a program which provides student self-directed time and collaborative teaching time. Blended, cross-curricular courses in the schedule could allow more choice and flexibility during the program. As in all of these examples, explicitly teaching a course like Foundations of Inquiry, and/or Digital Literacy, can go a long way in creating opportunities for DCL time, where students are self-directed and doing inquiry-based learning. Advantage: A more fully immersive opportunity for students. Flexibility for DCL time to be meaningfully integrated into the schedule. Students experience two different kinds of schooling. Disadvantages: A specific program selection process needs to be implemented. Support for students in a program different from the block scheduling can be challenging. ~ Students are removed from the traditional schedule. it were run independently, like the Inquiry Hub is currently being run. Teachers can be fully dedicated to the program, or they can be scheduled to support this program while also having courses in the regular schedule as well. Advantage: A completely immersive opportunity for students. Opportunities to extend learning beyond the school become much easier with full student scheduling. Disadvantages: A specific program selection process needs to be implemented. Support for students in a program different from the block scheduling can be challenging. Can produce scheduling challenges that make the model more expensive to support than a traditional model. ~ An entire school designed to support flexible, self-directed, cross-curricular learning. A student does not have a program defined by courses in a traditional block schedule. Students might still be grouped into teams or school-within-a-school programs around their interests, but not necessarily by their grade levels. Elective teachers would have scheduled times when they would support passion projects and theme-based learning challenges designed by students and teachers in different content areas. Learning commons provide support in different content areas. Students get support developing not just content related competencies, but also core competencies. Advantage: A completely immersive opportunity for students. DCL time is scheduled as part of every student’s schedule. Done properly, no additional resources needed to implement. All structures and student supports are focused around meeting the needs of students in a self-directed, inquiry-based school. Disadvantages: Very challenging to schedule, unless teams are created to have students cycle through elective and content areas. Support structures needed for students during DCL time. Considerable collaboration time is essential for teachers to support student needs. I’d love to see a public K-12 school implement a Montessori style elementary (with a focus on self-directed, exploratory, inquiry-based learning), followed by an IB Middle Years style program where teachers teach interdisciplinary and thematically (but without being an IB school), followed by an Inquiry Hub style high school, where students have the freedom to do epic projects that can impact their community and the world. But for now, I hope the options I suggest can provide educators with an opportunity to increase the time students get to Dream, Create and Learn, during their school day. When we provide opportunities for students to explore the world through inquiry learning, (whether those opportunities are teacher-guided or self-directed), we create an environment where relevance amplifies learning, and our students will develop projects that they will remember beyond their years at school. How will you help your students Dream, Create, Learn? 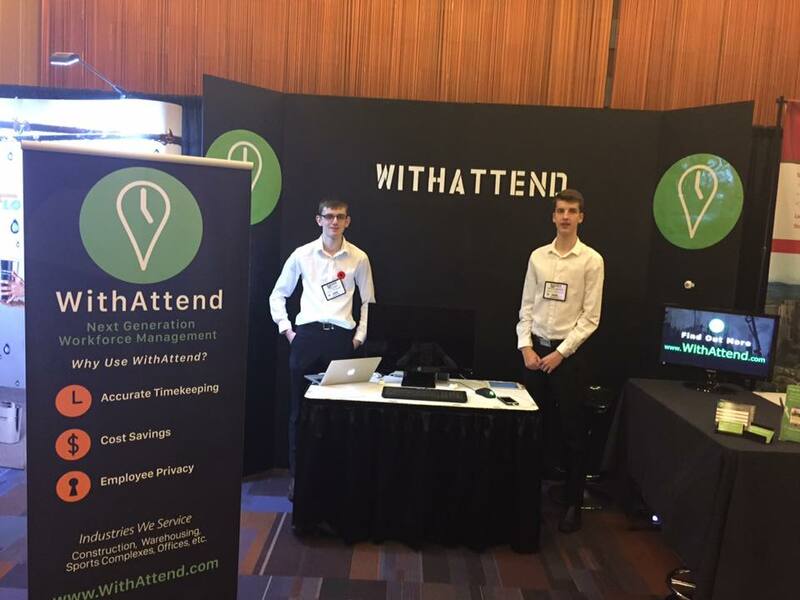 Last year two grade 11 students, Josh & Brandon, started creating an app using iBeacon technology to help our teachers take attendance. A year later we still don’t have an app for our attendance, and yet this this was one of a number of very successful projects that happened last year. The project took on a life of its own, and only now do the students have time to think about the school attendance app. The plan was that Josh was going to write the Android version of the app, and Brandon was going to write the IOS version of the app. This was the goal of their Independent Directed Study (IDS) that they were doing for credit at Inquiry Hub Secondary School in Coquitlam. However, the reason this attendance app is still not completed is because these boys entered a local ‘Pitch Your Idea‘ contest, and when they were rehearsing their pitch they were advised by the Tricelerate team running the contest that the application could be useful to businesses and not just a school. The boys ended up winning this (promotional student-only) contest and along with the $500 prize, they also received in-kind advising. They also ended up with a mentor from Tricelerate, who was excited about the potential of their idea. Their mentor connected them with a construction company, and then things got really interesting. Without doing a play-by-play, the boys went from creating an attendance app to creating a full ‘Workforce Management’ solution. So, the school attendance app was put on hold! 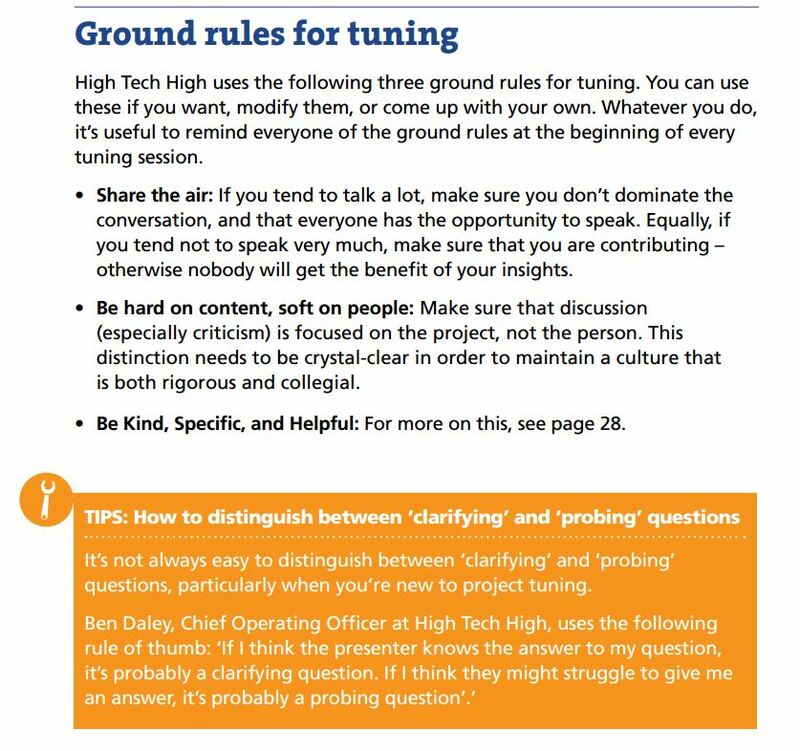 In an Inquiry Hub slide presentation created for ISTE2016, a few of the slides presented by our Superintendent, Patricia Gartland, Associate Director of Instruction for Learning and Information Technologies, Stephen Whiffin, and I, were about this student project. The specific slide shared below listed some of the learning that went beyond the expectations of the IDS course the students were working on. In addition to the very slick website they created, (without using Square Space or WordPress or other website creation tools), these students had to experience an incredible amount of learning that went far beyond learning to code the app. This learning included: Creating a ‘Pitch’ (shared above); Sales Presentations (to business owners in our community); Project Planning; Product (and logo) Design; Creating a company (Parents on board of directors); Financing a company (including decisions about investors); Hiring (their first employee was hired in June); Client Relationship; Customer Service; Pricing (with considerable research); Location mapping; Building a server; Network architecture (to make the business scaleable across different companies); and Time Management (the boys put in about 25-40 hours a week into this project beyond their school work). They also had prototype testing which included putting their sensors on construction sites, having employees download their beta versions of their app, and working with the foreman to fine tune features. Fortunately for the boys, the Inquiry Hub schedule does not put them in front of a teacher all day long and they could get some of this work done during the school day, because everything on the list above went beyond the original plan for their IDS course. Everything on the list above was relevant and needed to happen to get Josh and Brandon to the point where they could make this a viable business. In January, I spoke to the boys and I added an additional IDS course to their programs. I did this because they were putting in a considerable amount of hours learning all the aspects of creating and running a technology-based business, and the relevant (real-life) learning was adding up to significantly more that was expected for one course. The app design went from attendance monitoring to a fully integrated app that would connect to payroll, and employee management and safety. The business acumen required to pull this off far exceeded what a usual entrepreneurship course would look like. And the just-in-time learning that had to happen made course planning almost impossible. In fact, I was learning as much as the boys as the project progressed. From legal issues around starting a company as minors, to learning about pricing, conversations with these boys became lessons where I felt more like a student than a teacher. Instead of presenting just to me the boys were presenting to business owners and they were doing things like turning down funding/investors that other businesses could only wish they were getting. When learning is relevant, criteria is far less important than when students are doing work to meet the needs of an assignment. I felt that my job was far less to teach, and far more to ‘stay out of the way’ of what was happening. That said, the boys had their parents and a mentor involved and I was not only getting updates, but connecting regularly with the boys to learn about their progress. 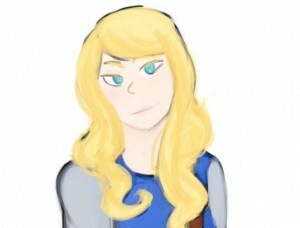 Sometimes I offered suggestions around things like the website and other general advice that was usefull, and sometimes when I’d suggest something I would be told why my suggestion wouldn’t work, or that they’ve actually got a better way to do things, and it was me who was getting the lesson. The current status of the project is that Josh and Brandon are actively searching for clients, and they have decided to create the school attendance app after all. In doing so, they will have a working proof of concept and if it works well, a glowing recommendation from the Vice Principal. But that’s not all they are doing, they even set up a booth at BUILDEX Express, a one-day tradeshow and conference for the Construction, Property Management, Interior Design and Architecture industries. I think this venture is going to be very successful in the future. But even if it were to end tomorrow, the learning that these students had to experience because it was relevant and time-sensitive to building their business has made this adventure a life-altering experience. One that has enriched their lives in a way far beyond what the original attendance app IDS could ever have achieved. Relevance truly amplifies learning! 2014/2015 Ken Spencer Award for Innovation in Teaching and Learning. The Inquiry Hub (iHub) is a pilot program of choice for public school students in grades 9 to 12. It provides an innovative, technology-driven, full-time program which allows students to pursue their own learning questions by shaping their educational experience around their interests instead of structured classes. Currently in its third year of operation, iHub serves a student population of 53 through a blended learning environment – 45 of these students attend school five days per week from 9 am to 3 pm and many of their course requirements are mediated through Moodle – an online learning management system. Our students are a mix of neighbourhood and cross-boundary kids who have chosen to come to our school. Their learning profiles include regular students whose families want a small school setting, as well as gifted students and students with specific learning challenges that include written output, attention and anxiety issues. Core, inquiry-based program offerings extended through the expansive offerings of Coquitlam Open Learning (online) courses. Imagine a student arrives at school and begins to work on a project primarily of her own design. Within a few minutes, she enters a state of flow (Csikszentmihalyi, 2000; 2004). Her sense of the passage of time disappears in the background and she is very absorbed in her work. The work becomes a reward in itself. For this student, schoolwork is a creative endeavour where failure occurs often, but is seen only as a necessary step toward enjoyment and fulfilment (Robinson, 2006). The challenge addressed through the Inquiry Hub program can be described as an attempt to cultivate student-engagement so that all of our students exercise their creativity and find flow in their work. We design our program with the aim of harnessing students’ intrinsic motivation to learn by making their school time more meaningful and relevant. In contrast, a more traditional secondary school is already limited by bell schedules, the transfer of students between classes and teachers, and the accepted practice of keeping all learners at the same pace. Typically, much of a student’s day is devoted to learning others’ objectives rather than her own. The Inquiry Hub program is an attempt to focus the learning experience more on the student’s interests but meet prescribed learning outcomes at the same time. Inquiry learning involves students in the planning of the work that they do. It is immediately meaningful and already comes from personal interest and intrinsic motivation. With a blended learning environment, students are able to complete sections of the course online at a pace and location of their own choosing. For example, a student may study notes and practice problems for math at home and ask for help with challenging questions at school. More significantly, two of our students are learning to build and maintain 3D printers as an inquiry project but they depend on online resources to get help when it does not work as expected. In addition, thematic learning is used as a way of designing cross-curricular and cross-grade lessons that are meaningful for students and have the potential to introduce students to key ideas and new directions for inquiry (Fogarty, 1997). For example, a documentary on the decomposition of food led two students to cultivate and study the behaviour of slime mould. All three teachers collaborate to plan thematic learning units so there is overlap with learning outcomes in multiple subject areas. 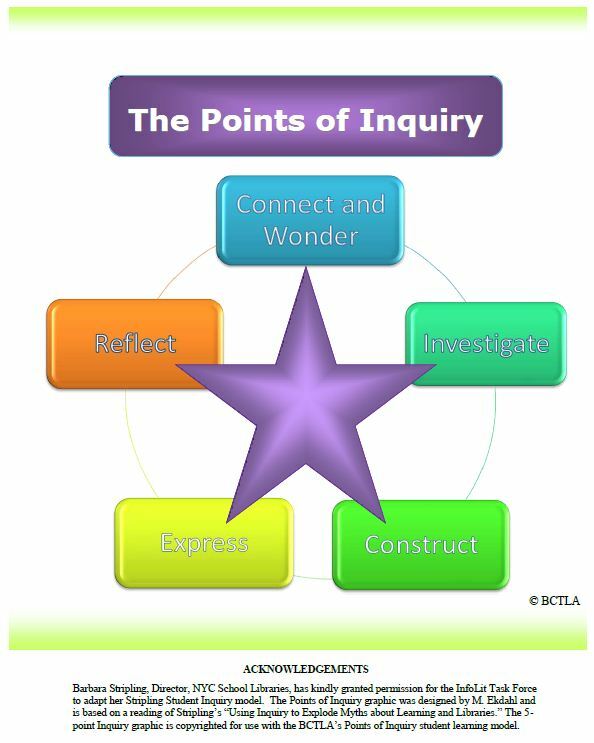 In our initial design of an inquiry program, all grade 9 students work through a course on the Foundations of Inquiry (FOI) that introduces a process or cycle of investigation (see resources). FOI supports students as they study topics of their own choosing on a small scale, within set timeframes, and culminates in presentations that demonstrate skills across multiple subject areas. IDS courses run similarly to the smaller projects in grades 9 and 10, but require far more focus, deeper learning and commitment (100-120 hours). Then, in each subsequent year, students would be able to design an Independent Directed Studies course (IDS) with the assistance of a teacher or administrator. In our second year, it became clear that most students were not yet prepared to find an area of interest, develop one or more research questions, and maintain a program of study to complete an IDS without losing interest. In addition, inquiry projects and IDS were regularly pushed aside or forgotten as students felt like they should be working on course work (i.e., the work available online). In order to overcome these challenges and emphasize inquiry as the central feature of the school, we created a learning pathway that begins with the initial Foundations of Inquiry in grade 9, continues with a second FOI in grade 10, provides an option to complete Science and Technology 11 as a science-oriented inquiry course, and continues to allow for IDS projects in grades 11 and 12. The second FOI course provides students with the experience to plan and work through processes such as design thinking, inquiry in the natural and social sciences, philosophical inquiry, and art inquiry. The capstone project requires students to set up their first IDS project that they may choose to complete in grade 11. In addition, inquiry projects may also be completed within courses. For example, a Science 9 student might develop a micro controller board, such as an Arduino Uno, into a lunar rover for an inquiry project. Our focus is to support personalized education by providing time and resources for students to define and explore their own inquiry projects, such as: designing and maintaining a school garden, writing a novel, or coding a new app. In our first two years, we have seen students construct and experiment with a 3D printer and CNC mill, learn to code Arduino microcontrollers to make music or operate robots, cultivate slime mould to study its behaviour, and design an aquaculture apparatus. In addition, a variety of smaller-scale projects have had persistent positive effects on the culture and learning environment of the school. For example, students have also provided us with a fish aquarium and they organized a ski and snowboard fieldtrip, floor hockey games, Halloween and Christmas events, and a computer programming club. We encourage students to pursue their interests and make learning visible through their ability to design new products, services and experiences. We promote stewardship with our students to take care our school, their community and the world. For example, our students volunteer within our school but also in the community. In our first year, as a school community we built our garden (an inquiry project organized by three grade 9 students). That same year and each subsequent year, several students have volunteered to remove invasive plant species from local parks. Furthermore, in our first year we assumed that the majority of students choosing to attend Inquiry Hub already had several topics they wished to study. However, in reality not all students were sufficiently aware of their own passions and talents to uncover an area of interest that they might sustain for an extended period of time. Similarly, the students’ interests, especially in grades 9 and 10, were very limited in scope and excluded much of the world. Thematic learning was introduced in part to invite students to think about big ideas, encounter more topics for study, and think across traditional subject areas. A recent theme focused on perspective and asked the question: How do we sense the world? The capstone project consisted of a photo, a short story, and a short film. Each creation was intended to deepen students’ understanding of perspective as they explored one of three binaries: love/hate, order/chaos, or life/death. These binaries were selected by the students from a larger set presented by the teachers. Through multiple iterations and progressive feedback from teachers and peers, students were able to generate some thought-provoking work both in what students perceived as failures and as successes. Thematic planning of units also has the potential advantage of grouping students together across grades (vertical integration) as well as across the curriculum. This allows for students to collaborate and learn with and from each other. Moreover, thematic learning allows three teachers to teach and support a wide variety of courses for students. A real challenge is the proliferation of Inquiry Hub supported courses as the program grows. In the future, we will encourage students, especially in grades 11 and 12, to get together around common interests and plan their own thematic units with the assistance of the teachers. The primary challenge with using blended learning is the creation and development of online components. We have some collaborative and preparation time to make improvements but we have had to efficiently utilize our face-to-face time with students to balance out limitations in the digital portions of the course. A more reliable online component of the course will also help us support more courses as necessary. We are continually evaluating the effectiveness of the Inquiry Hub and making adjustments. However, given that this is only year 3, quantitative data on graduation rates and similar data are limited. Consequently, we focus our attention on anecdotal feedback from parents provided through PAC meetings and individual conversations. We also have regular curriculum meetings involving teachers and an administrator. We discuss what is and is not working and devise a course of action for the short and long-term. Central to our success is the input from students. We often consult with students on proposed changes to the program. We provide explanations for our curriculum design and listen to their feedback. Most recently, we conducted focus group interviews with each grade level. Students were asked about the balance between student-directed and teacher-directed time, the value of thematically-planned lessons, and their experiences with the online components of their courses. 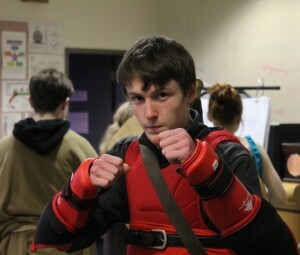 They were also asked if they had any ideas on how to improve their learning experiences. Students are largely responsible for creating the culture at Inquiry Hub. This is done through the clubs and groups they participate in, the field trips they plan and the inquiry projects they design with an outcome directly connected to improving the operation of the school and the quality of the student experience. Our students are very much involved in the development of the Inquiry Hub. Through student-led inquiry, blended and thematic learning, and our emphasis on cultivating student engagement, we believe Inquiry Hub is a potential learning partner for other schools. Furthermore, we believe that the program we are developing will work better for larger schools with more students, teachers and available resources. 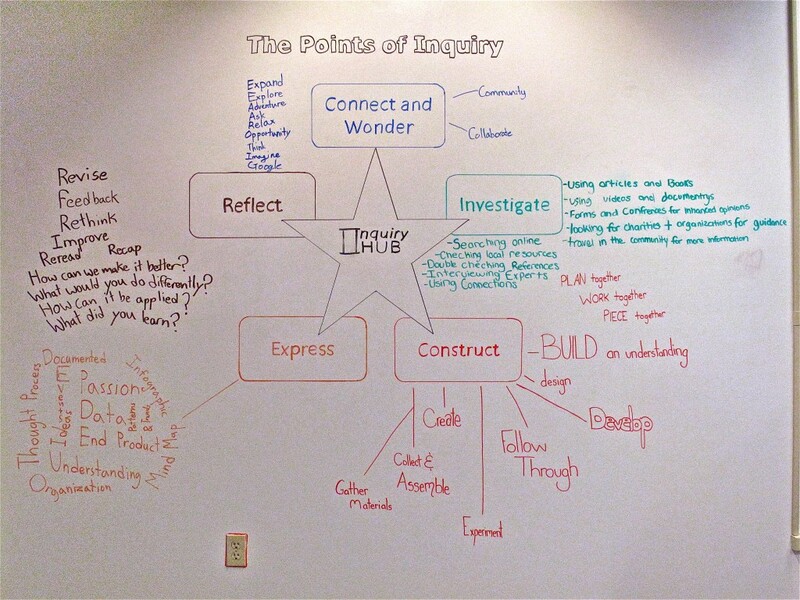 The long-term plans for the Inquiry Hub include a K to 12 vision of personalized learning. 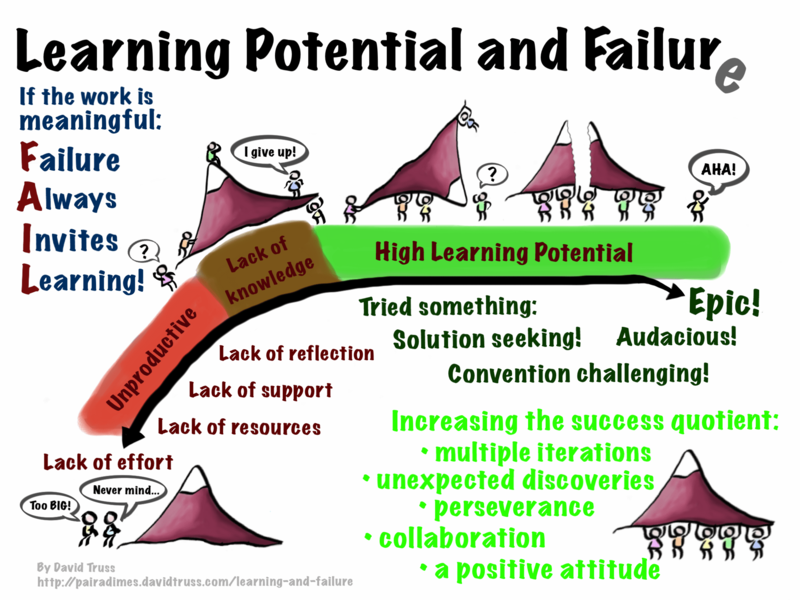 The model itself will need to unfold over a number of years, but a good way to describe it would be a continuum of personalized learning opportunities. For example, a K-12 school could have a Montessori or Reggio Emilia philosophy for primary years, a thematic/project-based pedagogy for middle years (similar to the IB Middle Years program), and the Inquiry Hub model for secondary school. In this system, students would gain self-regulation skills in the early years, be provided with large, thematic but primarily teacher-driven inquiry in the middle years, and then be prepared for large, personalized and student-driven inquiry in the secondary years. Currently there is discussion about creating a combined middle/high school in a new housing development in Coquitlam, BC. This would be an ideal place to expand the Inquiry Hub model into a larger program. We have had interest in our program from around the world with educators coming to see us from Australia, England, the USA, Ontario, Alberta and across BC. Currently a school is being re-modelled to be inquiry-based in Abbotsford, BC and they are using our Digital Media and Foundations of Inquiry courses as cornerstones to the program. With this quote in mind, we think that we are using relevant ingredients and creating a unique local recipe. Much of what we are doing is being shared and adapted to other local contexts and we are also open to learning from others. At the Inquiry Hub, students are actively engaged in their learning. For example, they have opportunities to set their own pace using online course materials, participate in a novel study by selecting from a range of books, form clubs that can meet during Friday afternoons, organize field trips, and, of course, design inquiry projects. Students are encouraged to share their ideas, perspectives and new knowledge through social media and personal blogs. They are asked to think about real issues, such as over population or genetic modifications, and develop an informed opinion. Ultimately, the success of the Inquiry Hub depends on our ability to support students as they take on real projects that have relevance beyond school, for example, urban farming, designing a tiny home, or 3D printing. Where students are able to pursue their interests, we collectively learn and experience a shared state of flow. If we are successful in our application, we would use the Ken Spencer award money to directly support student inquiries. For example, we might purchase VEX robotics kits for one group who would like to advance their understanding of computer programming through the development of robotics. Additionally, other students have an interest in inquiry focused on art or music, so funding might be used to acquire art supplies or even musical instruments. Csikszentmihalyi, M. (2000). Beyond boredom and anxiety: Experiencing flow in work and play, 25th anniversary edition. San Francisco: Jossey-Bass. Deci, E.L., Vallerand, R.J., Pelletier, L.G., & Ryan, R.M. (1991). Motivation and education: the self-determination perspective. Educational Psychologist, 26 (3 & 4), 325-346. Fogarty, R. (1997). Problem-based learning and other curriculum models for the multiple intelligences classroom. Arlington Heights, IL: IRI/SkyLight Training and Publishing. Last Friday three students at the Inquiry Hub Secondary School, in Coquitlam BC, organized a garden build. It started with Grade 9 student, Shauna, applying for and getting a World Wildlife Fund grant. This led to some inquiry questions around the best soil, water and temperature conditions for growing lettuce. And Friday’s garden build was the latest progress in developing an urban/inquiry garden for our school. Everything about this garden has been coordinated by the @GreenInquiry team, from: getting permission from the school district; to coordinating students, parents, community members, and teachers to help; to purchasing plants, seeds, supplies, equipment & materials; to planning for summer maintenance; to future community outreach, and education programs for a local elementary school. By implementing a series of IDS – Independent Directed Studies courses, we will be building a high school program that allows these students to design a fair bit of their inquiry work time at the Inquiry Hub, while earning credits for high school graduation. I’m speculating now, that by the time these Grade 9 students graduate, their Green Inquiry website will be a learning portfolio that will have any university they want to go to very interested in these students! Here is a wonderful time lapse taken from our learning commons window. There are some images shared afterwards to show some of the things missed by this point of view. Congratulations to the Green Inquiry team, and to the Inquiry Hub community on their incredibly successful garden build! Update: See their blog post, Successful Garden Building Day! Here is the slide presentation from our Inquiry Hub Information Session on January 22nd, 2013. Applications for September 2013 are now being accepted. We are now working on our third inquiry projects at the Inquiry Hub. What wasn’t mentioned in this video is that one of our students has applied for a grant to start a garden, and it is hoped that some of what is learned here will help us with the location and resources used in our garden.